In 1866, thirty-year-old painter James Tissot bought land to build a villa on the most prestigious of Baron Haussmann’s grand new boulevards, the eleven-year-old avenue de l’Impératrice (now avenue Foch). By the Salon of 1868, Tissot had occupied his newly built mansion: the intriguing details in La Cheminée (The Fireplace, c. 1869, private collection) and L’escalier (The Staircase, 1869, private collection) almost certainly were painted from its opulent interior. Tissot’s studio, a showcase for his renowned collection of Japanese art, became a landmark to see when touring Paris – and, for Tissot, it was a brilliant marketing tool to attract commissions. His collection of Japanese art and objets had grown to include a model of a Japanese ship, a Chinese shrine and hardwood table, and a Japanese black lacquered household altar, along with dozens of embroidered silk kimonos, Japanese dolls, folding screens and porcelains. In 1869, he assimilated these exotic items into elegant compositions in three similar paintings featuring young women looking at Japanese objects. By the 1930s, the version below was hanging in an interior decorator’s store on Third Street in Cincinnati and was purchased by Dr. Henry M. Goodyear; he and his wife gifted Tissot’s picture to the Cincinnati Art Museum in 1984. I recently made a trip to Cincinnati specifically to see this painting. The Cincinnati Art Museum is beautiful, has an impressive collection, and is vibrant and extremely popular. It is one of the oldest art museums in the United States. Following the success of the 1876 Centennial Exhibition in Philadelphia, when public art museums were a new phenomenon, the Women’s Art Museum Association was organized in Cincinnati, and the Cincinnati Museum Association was incorporated by 1881. Five years later, a permanent art museum building was completed – the first purpose-built art museum west of the Alleghenies, heralded worldwide as “The Art Palace of the West.” It has greatly expanded since then. 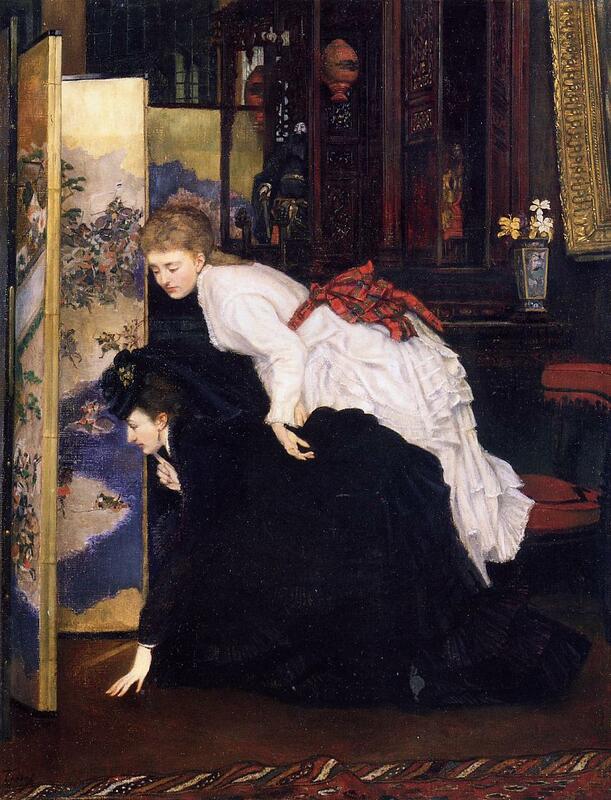 Young Women Looking at Japanese Articles is just exquisite – painted in Tissot’s academic style in a rich palette, it has a glossy, enameled finish and features abundant exotic details. The women’s faces are sweet and contemplative, and their costumes are lovely. You’ll notice that the central figure’s ensemble is actually red, not brown, as indicated in most photographs of this work. It is such an engaging work that I took well over a dozen close-ups for you to enjoy. © 2018 by Lucy Paquette. All rights reserved. 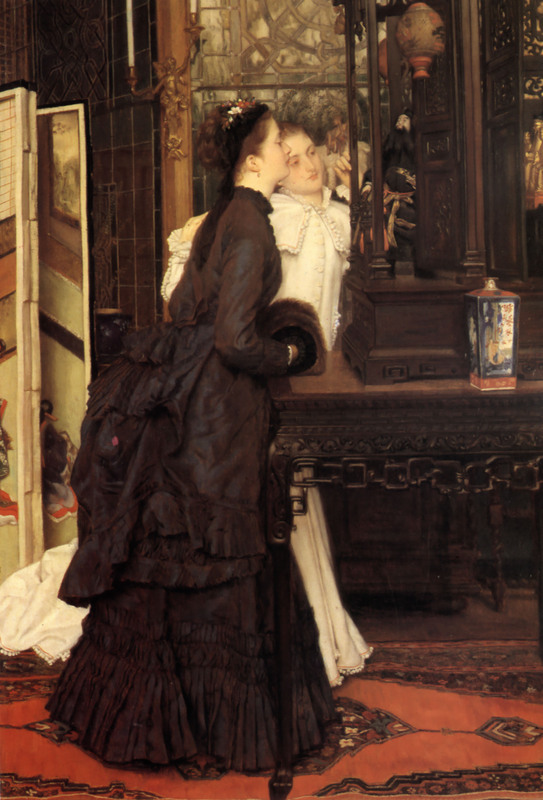 This entry was posted in Art blog, Art History, Impressionists and tagged James Tissot on May 15, 2018 by Lucy Paquette, author of The Hammock: A novel based on the true story of French painter James Tissot.